Now, straight after that I went to Chengdu to go to the Blue Roof Museum with Gareth Williams to help install an art exhibition. It was a large show, and had it’s challenges, but was a pretty interesting and entertaining experience! Great to be able to share this work with people in China. A shot of the installation of my work “Kia rongo i te tāwara o te wai” in the Blue Roof Museum – a collaboration with Ben Woollen and Horomona Horo. And coming up next… “TO SLEEP” – a sleep concert. 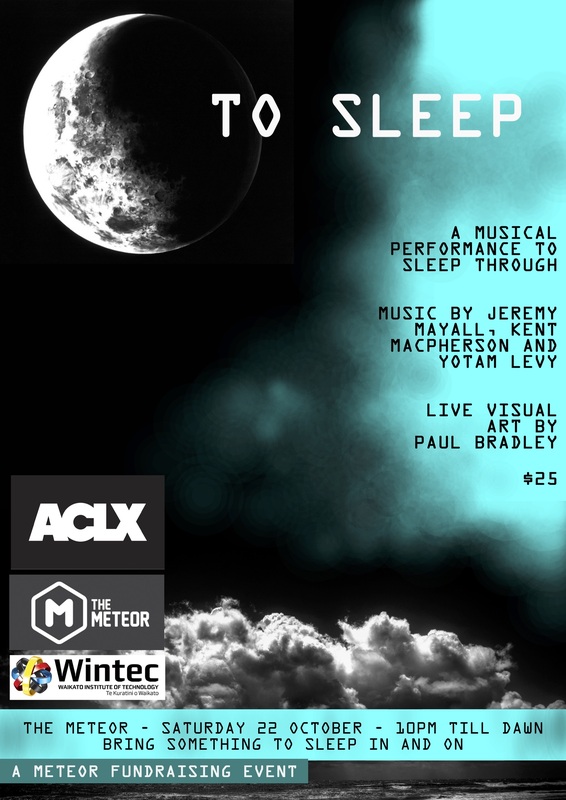 Working again with Kent Macpherson, Yotam Levy, Paul Bradley and Aaron Chesham we will be presenting a 9hour concert designed for you to sleep through! The concert starts at 10pm on Saturday 22nd October and ends around 7am on Sunday 23rd. About 9hours of multimedia-enhanced sleep! Live music and art. Together. While you lie back and experience the slowly shifting states. Put it in your calendars now and then come prepared with something to sleep in and on. It will be quite an experience! Tell your friends. 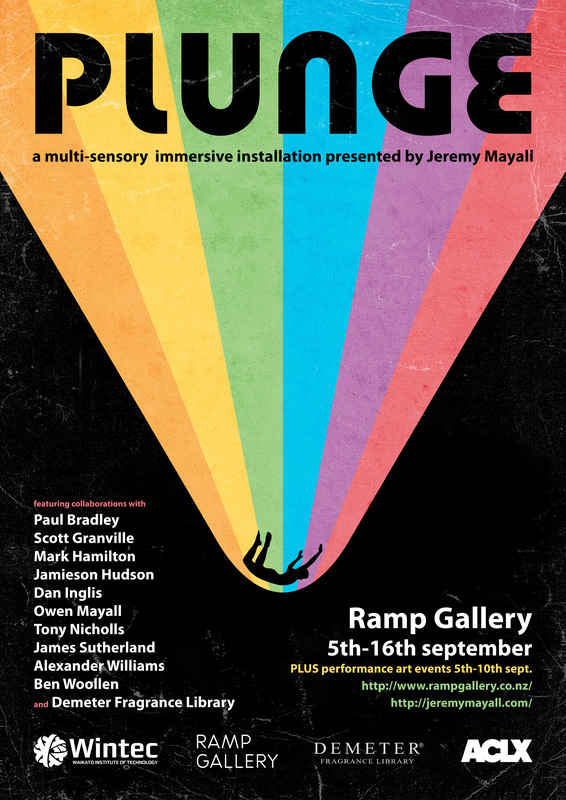 The next big project for me is PLUNGE – A multisensory immersive installation at Ramp Gallery. PLUNGE explores new ways of experiencing and discovering art – by having visitors use all five of their senses. You will be tasting, smelling, touching and hearing (along with the usual ‘seeing’). PLUNGE is the result of ongoing explorations and collaborations between experts in sight, sound, taste, scent and touch. An immersive experience where new sonic artworks are further activated by connecting to other stimulus receptors. This is a very intimate exhibition, which requires the audience to become part of the artwork. Each piece stimulates different senses and explores ideas of perception and the fluctuating human experience of time. Each work features a sound element created by Jeremy Mayall, which has been paired with collaborators in different fields: Dan Inglis and James Sutherland (moving image); Paul Bradley (visual art); Jamieson Hudson (baking/design); Demeter Fragrance Library (perfume). Along with the skilled support of specialist craftsman/artists/technicians Tony Nicholls, Owen Mayall and Brad Morgan to help construct each experience. The inspiration for PLUNGE comes from ongoing compositional experiments by Jeremy, along with a range of neuroscientific studies, which explore the concept that none of our senses work in isolation, and that they are deeply interconnected and influential on one another. The works, through the common thread of musical composition, explore an ever changing thread of consciousness where you begin to notice the way that your brain shifts perceptions between our internal and external worlds. These works create a state that engages the brains own tendency to build worlds, find patterns and make connections, allowing the multi-sensory experience to provided a heightened sense of engagement with each work. PLUS – as if that wasn’t enough, there will be a week of performance art events around Hamilton from 6th-10th September. See individual event listings and follow RAMP GALLERY on facebook for more information. Celebrate the opening of this exhibition. This includes a brief artist talk, and the various collaborators will also be present. The works include collaborations with: Paul Bradley, Scott Granville, Mark Hamilton, Jamieson Hudson, Dan Inglis, Owen Mayall, Tony Nicholls, James Sutherland, Alexander Williams, Ben Woollen, and Demeter Fragrance Library. This is your opportunity to take part in a unique performance art experience where you become part of the artwork. Sure to be an experience unlike any you have been part of before. Featuring live photography by Mark Hamilton. Refreshments provided. Join us for a night of short films – including a range of collaborative projects currently unscreened in Hamilton. This is also the album launch for “CONVERSATIONS” – a collection of works for solo instrument and electronics. Also: see the world premiere of “For the Stars from the Undergrowth” a film by Ben Woollen with music featuring Adam Page and Horomona Horo. – Wonder Horse, Victoria St.
Get your tickets to experience the premiere of three new compositions which have been expertly paired with matching cocktails. Sip your drink and experience the full cross-modal multi-sensory effects of this innovative collaboration between Alexander Williams from Wonder Horse and Jeremy Mayall.